In the United Kingdom, Q Drive Driving School offers driving lessons with fantastic and flexible features for all learners, across Birmingham, Peterborough and its surrounding areas, with its highly qualified Instructors. Crash course in driving could be a 30 hour, 5 day crash course, which is ideal if you are under 21 years and a complete beginner or someone who has had lessons before, but might be very nervous. There is a choice of training course which you will cover in either 5 days or in blocks of 2 hours, leading up to the Driving Test. The Driving Test will be booked on a date and time that is available according to the DVSA bookings schedule. You can choose to start your Training 5 days before or over a period of time leading up to the Test. The 30 hour Crash course Syllabus is split into 3 stages that covers all the Topics that are needed to be learned in order to pass your driving test. Our Q DRIVE Instructor has a course designed to be flexible. 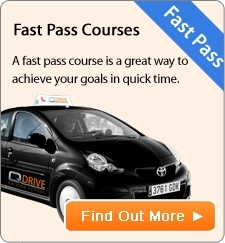 Pass your Test, with our tried and tested Intensive crash courses. Guaranteed tuition with our highly Professional instructor with no car sharing. New and modern air conditioned cars. Friendly, patient approach to teaching. Driving Test booked for you. We know you will be curious and want to know more from us so just contact us at your earliest convenience. To speak to our experienced driving Instructors who will explain further our services on offer, plus will help you in choosing the appropriate driving course according to your needs, age and experience. Intensive driving courses, are often referred to as a crash course or Fast track driving lessons, which are truly ideal for those who wish to drive quickly. There may be many reasons, best known to an Individual, these Intensive driving lessons or Intensive Crash Courses are specially tailored for the Pupils needs, be it 2, 3, 4, 5 or 6 hours per day, which can be spread over a few days or weeks. At Q DRIVE we take all the necessary precautions to ensure the safety of our Learner Drivers. We always advise our students to pass their Driving Theory Test prior to booking a driving Crash course. All our Intensive Driving Courses are delivered on a one to one basis, to be sure you get the driving hours. Our Instructors are courteous and always very patient. We give our assurance to arrange your driving test for the most local driving test centre possible. According to the government, on average those who have passed their driving test have had about 45 hours of professional training combined with several hours of private practice. Most learners who have thus prepared, do better in the test. This is the data that was released by "DVSA". At Q Drive we endeavour to get our learner drivers ready for test by 35 hours. Each learner has a different rate of learning so our course is tailored around their needs. You can check out our website to enroll with us and be assured of our reasonable prices, quick and best results. So what are you waiting for, contact us at 0 121 667 8356 or 07802 409 494 for your intensive driving course in driving and crack your tests.